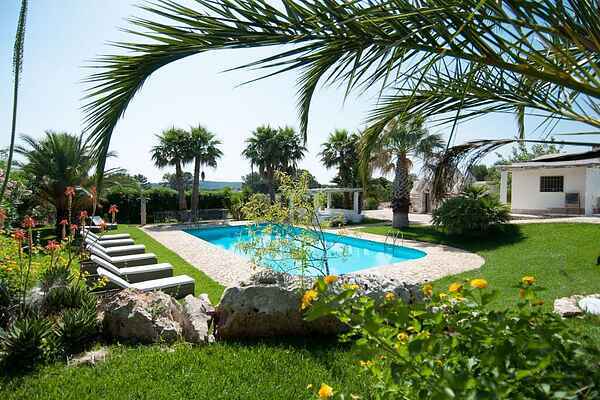 The trullo is a luxury holiday mansion in Puglia. These authentic trulli are conservatively restructured in full consideration of their old charm and have been beautifully decorated. The villa has a large private swimming pool of 14x7 meters and accommodates easily up to 10 guests in four bedrooms and two alcoves. Every corner of this spectacular holiday home has been designed with good taste and eye for details. The interior part of the house has been decorated in comfortable and classy style and is completed with nice objects that will make the renters feel at home immediately. It disposes of a main building and a dependance. Next to the pool is a small terrace with masonry chairs and comfortable cushions. The large swimming pool (14x7 meters and up to 2,5 depth) and giant palm trees complete the spectacular garden from where you have an amazing view! The trullo is scenically located on a small hill in the countryside of Ceglie Messapica and offers maximum privacy to its guests. This gorgeous holiday rental is ideal for families with (small) children who are looking for a carefree and luxury holiday!